The heart of reverse osmosis filter, the RO membrane is available in a variety of specifications defined as the GPD or Gallons per Day. Generally speaking the higher the GDP the greater the cost. Your choice of membrane should relate somewhat to the model of filter that you have. For example there is little point paying extra for a 80 GDP membrane if you have a domestic RO system from which you use only 5 gallons per day. Generally it is sufficient to check the capacity membrane your system was supplied with and order a replacement of a similar capacity. Under normal water conditions most membranes will last for approximately 2 years before requiring replacement, providing that the pre-filters have been properly maintained. 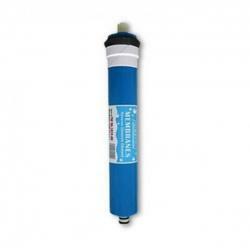 Osmio D7 Reverse Osmosis Replacement Membrane The first three pre-filters are the prot.. Replacement Pure-Pro RO Membrane - suitable for the Pure-Pro ERS-106A Alkaline R..